Master Sgt. Cameron Freeman (right) charges up the pitch (the playing field) during a 2013 match put between the Air Force team and the Army. 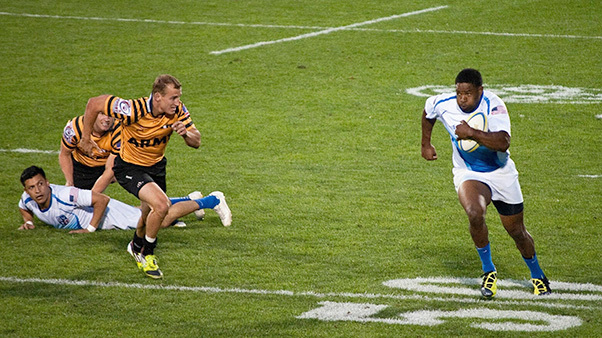 The match was part of the 2013 Armed Forces Rugby tournament where the Air Force ultimately took second place overall. When young Cameron Freeman came home from school with a black eye and told his mother it happened playing rugby, she wanted to know who ‘Rugby’ was and how to call his parents. This is how Master Sgt. Cameron Freeman, 412th Security Forces Squadron noncommissioned officer in charge of training, described the beginning of his love affair with rugby, one of the fastest growing sports in America. “I got started on my high school team in Vacaville (California) in 1998,” Freeman said. Now, nearly 20 years later, 36-year-old Freeman is an Air Force Championship rugger – the term for a rugby player – still playing his favorite game, and passing the love of it on to anyone who is interested. He’s been playing for Air Force rugby teams off and on throughout his Air Force career, helping win championships in 15s, and then moving to sevens in 2012. Rugby sevens is a variant in which teams are made up of seven players playing seven-minute halves, instead of the usual 15 players playing 40-minute halves. Freeman was selected for the World Class Athlete Program in 2014. 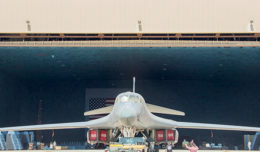 The Air Force World Class Athlete Program, known as WCAP, is designed to allow elite athletes the opportunity to train and compete in national events to make the Olympics. “I got orders to Chula Vista (California) to train for six months,” he said. 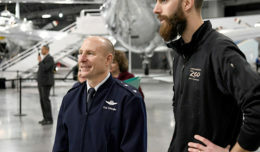 Although he didn’t compete on the Olympic team, his experience was still valuable, and after some time away due to a minor injury, he recently competed with the Air Force team at the Las Vegas Invitational in early March. According to Freeman, playing for the Air Force team can be a different challenge than playing with a regular team. His next rugby challenge is mid-June at the “Bloodfest” in Austin Texas, and then plans to compete in the Air Force Championships in Glendale, Colorado in August. Rugby has the appearance of a violent and dangerous sport, but Freeman said that it is actually fairly safe. Freeman said that at 36, it may be time for him to consider slowing down, but he still wants to be actively involved in the game. He is passing the love of rugby on to his four children, and would also like to start a touch rugby program locally.